Concorde Capital CEO Igor Mazepa gave an exclusive interview to the Interfax-Ukraine news agency (Part Two). – You said you have mandates to sell. To whom do you hope to sell to then? – Of course. If I see foreigners exiting in the consumer sphere, then in the same real estate there are foreigners entering, just as there are those exiting. And in infrastructure we see significant interest in entering. Medicine is still growing. And commerce is growing – there is an enormous amount of local investors there. I want to note that in the last two-three years, a stratum of solid local investors has been formed. We are currently in the process of closing several deals in attracting money to the capital of local companies in which a minority stake is being sold. A kind of quasi-private placement, which is what we started doing back in 2004-2005. – What kind of dynamic do you have compared to the prior year? Do you have more deals in the pipeline, or less? – We are bursting at the seams! Wehavebroughtontotheteampeoplewhoarenew, freshandare adapted tothe realities of today’s market. That reflects activeness rising to the top. I see it in my own busy schedule. At Concorde, we have doubled our investment banking and trading departments. Our lawyers are overloaded with due diligence work. Bytheway,of thosewhocamefive-eightyearsago, manywoundupabitoutoftouchwiththemarketsinceitveryquicklychanges, whetherit’s thedemandsofclients, thedemandsofforeigninvestorsandthechallenges withinbusinesses.Forexample, debt loads.All this very strongly influences approaches and appraisal methods. That’s why we’re very actively modernizing our team in line with the signals of the market. – What precisely are you trading? – Eurobonds, as well as a couple of private placements. – In Ukraine or abroad? – We are selling here and there. – Not long ago at the start of the year, Horizon Capital held an IPO for the Moldovan wine producer Purcari Wineries. That is probably the first deal in this region for the last few years. – We are moving towards closing a deal in e-commerce. I will be able to discuss this in detail a bit later. Besidesthat, wearedefinitelygoingtodosomethingwithDobrobutsincethecompany, as expected, is going to grow and, most likely, it will be necessary to raise financing. – Last year, the Synevo medical network held an IPO on the Hungarian exchange. It positioned itself as a part of a large holding company, but – in any event – it’s the first medical project that confirmed that there’s interest in medicine. – Anexamplethatismoreillustrativeforusis Georgian Healthcare Group, which held its IPO in London at the end of 2015. The company’s capitalization was GBP 218 mln at the time. By the middle of last year, its capitalization has already exceeded half a billion British pounds sterling. Medicine is a very capital intensive sector that needs tens and even hundres of millions of dollars. So deals can certainly be expected there. To sum up on the whole, fast-growing and dynamic companies always have the chance to attract financing, even investments in shareholder capital. These are good signs that in 2020, after the elections, a public market for Ukrainian companies can be expected. – Doesthatforecastdependinsome way on pension reform? – As usual, there’s no internal money, or very little, and I’m not especially counting on it. Iexpectthatinthenexttwoyears,manydeals – asin 2005-2006 – willbeconductedinLondon, Warsawandotherforeignstock exchanges. – So we’ll shift towards your real projects. We already touched on Dobrobut. Please clarify your share at the moment. – I have just under 33%. – Do you and the other owners have plans for its further development? – Yes, of course. After all, Dobrobut is growing 60%-70% per year. It is certainly the largest private medical company, with a lead over its closest competitors by several times. – Even when others are also growing? For example, Oberig, Into-Sana … Boris somehow stopped at one level, but, in any event, private medicine is growing. – Yes. The market is prospectful and everyone is looking for the right model within it. – Everyone is expecting medical reform probably? – Unfortunately, I can’t call what is happening now reform. In my understanding, this is simply a means of redistributing state money. Whatwasdonedoesn’tinanywayattractmoreinvestmentstothesectoranddoesn’tmake services less expensive or more competitive. It’s simply changes to the distribution of state funds that is long overdue. Just as the medical services market was about USD 5 bln, it will more than likely remain that way. If this were reform, it would be understood that the market volume this year would be USD 5 bln, next year would be USD 7 bln and in 2020 USD 10 bln. I would call that reform. – That is to say the availability of health insurance would have been better for you? – The whole world works this way. By the way, I examined how much health insurance costs for one person in Ukraine. It costs about UAH 10,000-13,000 per year at Concorde. That is about USD 500 per person. Analogous insurance in America and Western Europe costs USD 3,000, 4,000 or even 5,000. That is, working at Concorde, I am underinsured by a dozen times compared to my colleagues in the West. And we’re saying that about Concorde. So what can be said about those who work in the factories or mines? It’s $90 per person there and that’s nothing at all. Unfortunately, this reform doesn’t answer the question of how to raise the level of insurance coverage from USD 90 to USD 120 per person in the first year, to USD 150 in the second year and to USD 200 in the third year. That’s why I view the medical reform neutrally. It’s truly the right step, but not in any instance can it be called reform. – Let’s move towards FinTech. In the mass media at some point, you were even named as the main intermediary in transferring money from Russia. – Also named were Boris Lozhkin (former head of the Presidential Administration) and (President) Poroshenko. From what I know, it was Dubinskiy (producer at the journalist investigations department at the 1+1 television network, editor of the Hroshi television program Oleksandr Dubinskiy – Interfax). That basically answers any questions. Everything is truly developing with FinTech but with a single reservation – there isn’t any Russia there. The share of foreign transfers there is insignificant. The main thing is domestic transfers, the volume of which grew after our company began to actively work with Nova Poshta. Nova Poshta is the large operator of postal forwarding, and postal forwarding is online commerce. One is related to the other. These billions in volumes of transfers, which are shown in statistics, they – among other things – are explained by the fact that they – though appearing in our accounting – truly go through our partners, for example Nova Poshta or Privatbank. SoFinTech is interesting, all the more so after what happened with PrivatBank. After its nationalization, the management team that actively bet on money transfers left. And this market became more prospective. And competitive, at least. – So do you plan to expand to other spheres of FinTech (financial technologies – Interfax) or will you remain in this company for the time being? – I will remain in this company, where I have a minority stake. If some develops an interest in it, I will gladly sell it. It’s a question of price. – Do you believe in the development of the crypto-currency market? Do you trade them yourself? – I believe in its development, but I don’t trade in it. Specifically, I don’t believe in crypto-currencies as a means of savings considering their high volatility. But I believe that with time, all financial streams will move towards the blockchain technology. Governments can endlessly try to fight against this, but the history of Telegram – in which Roskomnadzor couldn’t block it – makes such attempts look ridiculous. The same thing will happen with BitCoin – it’s doubtful someone will be able to change something. It likes denying the ubiquitousness of the Internet in the early 2000s. I think that the best the government is capable of doing is leading the process. But for that, trust in the government should emerge, as well as in good regulators. Technology is definitely progressing. – And your investments in real estate, in particular the GoodLife Park project? How are things going with them? – GoodLife Park is now our main project. We are buying the neighboring plot with an area of about 10 hectares with the calculation that the clean cash stream from the project in this way will grow by USD 15 mln during the next three years. – What other investment spheres are of interest to you? – Not long ago we became interested in the construction of a cardboard factory. It’s a purely opportunistic project. The main bet is that cardboard is a good indicator of a recovery in consumer markets and it has grown during the last three years by 15%-20% annually. – Interesting. Cardboard is a classic product that, it would seem, had been divvyed up on this market long ago. Is there still a niche for cardboard in Ukraine? – Of course. Firstly, some factories remain on the occupied territories. 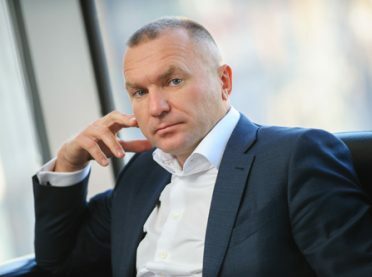 Secondly, the Zhydachiv Cellulose Paper Plant has stood idle for a long time since its shareholders – Brodsky (businessman Mykhaylo Brodsky- Interfax) and Kolomoisky (businessman Igor Kolomoisky) couldn’t settle matters between the both of them. Besides that, there were constantly some kind of conflicts at the Rubezhanskiy Cardboard Packing Plant. That’s how such a non-core investment turned up for us. – Are you the single investor in this project? – No, we are engaged in it with co-investors, partners. We will reveal the details closer to its launch. – Where will production be situated and how quickly will it be launched? – In the Khmelnytska region. I think we will release the first products in September. – What else are you involved in? – We are participating in the restructuring of debt obligations. – It’s said that Concorde Capital, among others, is involved in the restructurization of Ukrlandfarming debt. – We don’t have any business relations, contracts or agreements with Bakhmatyuk (the agri-holding’s owner Oleg Bakhmatyuk – Interfax) and Ukrlandfarming. Tomymind, AlexParaschiy’sanalyticalteamisthefirstthatunderstoodandrevealedthefullgravity of the company’s debt situation. That’s why we are always firmly criticizing it. Oleg Bakhmatyuk is a very charismatic personality. In regards to attracting money, Bakhmatyuk is the Ukrainian Elon Musk. Even cooler, just as Musk attracts funds for space projects, Bakhmatyuk does so for down-to-earth projects, literally. But in terms of mastering the attraction of funds, Bakhmatyuk is no Warren Buffett. More likely, the very ease with which he attracted funds prevented him from effectively using them. But I see his public desire to emerge from his debt situation in a dignified way. I think it will work out for him. The experience of Donald Trump, having survived six corporate bankruptcies, is very indicative in this sense. If you were to ask whether we want to participate in resolving the debt problems of Ukrlandfarming, of course I would answer, “Yes.” But so far we haven’t reached a decision on which side we would prefer to participate. – RegardingtheEurobondsofPrivatbank, theliabilitiesforwhichwerewrittenoff: currently its owners are trying to return their losses in London arbitrage. Had Concorde earlier communicated with some of the Eurobond holders? Are you somehow involved in the process of returning resources from any of the sides? – The bondholders formed a committee and appealed to the London court. There is a very high likelihood that the bank will have to pay its obligations. The question is merely how long can it postpone these obligations. – Is Concorde Capital a minority shareholder in the Latvian PrivatBank? – Yes, we have a 9.23% stake. – And what plans do you have for this stake? – If the state doesn’t sell its stake,then it will be appraised at zero because the regulator will simply confiscate the license. If the state sells but no one buys, then it will all the same be valued at zero. If the state will sell at a wise price, then probably there will be some kind of interest from investors. – So the best option for you would be to organizev professionally an auction for its sale? – As far as I lnow, the Rothschilds are preparing its sale. Accordingly, Iamconvincedthateverything will be professionally organized and everything will be discussed in an understood language. And later we’ll see. – WilltherecentscandalinLatvia’sbankingsector,and its consequent tightening of regulations, somehow affect this sale? – Yes. Everything there has been reduced. Notlongago, thegovernment’sintentionsbecamepublicofrestrictingnon-residentialbusiness- thatisnon-European, whichispredominantlyRussian-speaking – to 5%. Thatisreducingitfrom 90% to 5%! – But are you a shareholder in the bank as a Cyprus investor? Thatis, would theseintentionsaffectyouless? – The issue is not about ownership, but the client base. Thatisboth inassetsandin liabilities. – What other foreign investments do you have? – None so far. But I am constantly closely exploring. – So Ukraine is more interesting? – Hereiswhatweknowandlove: weknowthelocalstressfulsituations, welovetoimmerseourselvesinthem, figurethemout, and try to resolve the situation. By the way, we very actively work and communicate with lenders, the holders of debts of other companies whether they’re commercial banks, the Deposit Guarantee Fund or someone else. – DidyouparticipateinDepositGuaranteeFundauctionsofthe assets of insolvent banks? – Yes, we buy something from time to time. But we certainly don’t take anything for ourselves. Amongtherecentcases – notlongagowe bought the right to claim the credit of one Ukrainian company. There was a stressful situation there and we simply help the owner resolve it and find a respectable buyer for its obligations. That way, we are freeing people from stress while at the same time gaining a mandate for a deal. – And what about your interest in the privatization of state property? You participated in the State Property Fund auction for the blocking stakes of DTEK Dniprooblenergo and DTEK Zakhidenergo and attempted to acquire Sumyoblenergo. – InvestorsareverycarefullylookingatUkrainianenergycompanies, in the first placebecauseoftheirownershipstructuresandoverregulation. But sometimes assets come across simply at throwaway prices, when it’s understood even to cautious foreigners that money can be made on them. We’re talking about lastyear’ssaleofassets,controlledbyDTEK,whichwecouldn’trefrainfrom participating in. Regarding Sumyoblenergo, we had foreign investors who submitted an application for DTEK Dniprooblenergo and afterwards Sumyoblenergo by inertia. But then we talked them out of it. The price the State Property Fund informed us of turned out to be unjustified. – Nonetheless, your interest in privatizations remains? – Of course. I have a pool of investors now who are interested in Centrenergo. So if there is a privatization, I will definitely submit my price proposals. – Сurrently, investments in the agricultural sector and alternative energy are trendy again. Are you interested in these spheres? – Yes. Returning to what’s popular and interesting, it’s absolutely solar energy, and renewable energy on the whole. We calculated the domestic norm for rate of return of investments in helioelectric stations. If to finance them using own resources, without attracting debt capital, then that amounts to about 18-19%. If to attract 70% in debt, depending on its value, the norm for the rate of return grows to 30%, if that kind of price is within an intelligent range. Obviously, there is demand for similar projects, including from foreign investors. We have already participated in a series of big deals and are considering arranging several more. – Have you estimated the general volume of this market? – Yes. Based on projects that we’re aware of, which are in this or another stage of implementation and where there are real invested resources – it’s about 2.4 gigawatts, or about two nuclear reactors. But there’s a problem – the consumer suffers from this, above all manufacturers. These figures can be multiplied infinitely, but who will want to buy electricity taking into account its сost? We need to launch an enterprise, but we face a rate of 10 cents for electricity. Accordingly, it’s important to understand whether we have an adequate supply of marginality that will allow for such a rate. With сardboard (production), the margin will allow for it, but if it’s something else, massive, then no. And that means that new factories and enterprises won’t open while old ones will shut down. Entrepreneurship on the whole will decline. So we have a twofold situation: non-traditional electricity at a consumer rate of 15-25 eurocents – which is fine for rate of return norms but certainly not a market rate – and the time when this will stop, which should come. Tenyearsago, wewroteinourinvestmentoverviewthecompetitiveadvantagesofUkraine: acheap, educated workforce; cheap resource; and cheap electricity. But now there isn’t any labor, and what we have is often not qualified, if to judge based on the criteria of effectiveness. So a cheap labor force is no longer an argument and the price of electricity also isn’t. So what is left? — We have such a company, but it’s going to be involved with other projects, in the real estate sphere in particular. – After all, many have similar assets. Forexample, Stavnitser (the co-owner and general director of the TransInvestService port Andriy Stavnitser) has a restaurant. That’s why I inquired – maybe you have something similar, for the soul? – A restaurant for the soul is not our style. I’d rather visit a restaurant for the soul. I have a very serious approach to investments in recreation and restaurants and usually think of them as I would a business. It’s better to sit and enjoy a tasty meal in someone else’s restaurant than sit in your own and think each time of how it will sell. That’salreadyadeformation. – Earlier you had a currency license. Is the ForEx market interesting for you now against the background of expected liberalization? – We need a currency license in order to trade instruments with foreigners in their currency. This doesn’t mean trading currency as such. It can also be trading hryvnia instruments, in which we are no less active in. For reaching these goals, we have a Cyprus-based company that is licensed and regulated in Cyprus, through which we attract Western money and trade on Western markets. In regards to ForEx liberalization, I hope that it happens some time. – This “some time” is supposed to be understood in the way that you don’t expect something similar in the nearest future? – IthinkthatifUkrainecontinuestocooperate withtheIMF, thecurrencyliberalization will happen quicker. In the opposite event, the National Bank is going to approach this more carefully, especially after it toyed with the discount rate and lowered it to 12.5% annually. Just once and inflation shot up. The same can be done with currency liberalization. But once pressure on the exchange rate emerges, the central bank will have to toughen regulations again. As I see it, the National Bank is going to approach these things more carefully until the situation with the IMF is resolved. – It’s been said that you have a mandate to organize an issue of Naftogaz bonds? – No. We know that Naftogaz currently sent out an RFP (Request for Proposal) to banks. But mandates so far have not been distributed neither for Eurobonds, nor for domestic obligations. – In general, all of you are involved in similar deals? – Yes, we currently have a mandate to issue Ukrzaliznytsia bonds for UAH 2 bln. (Concorde Capital is the underwriter for placing four series of Ukrzaliznytsia bonds for a sum of USD 2 bln – Interfax). Regarding UAH-denominated debt on the whole, it’s exclusively a question of price currently. Securities can be floated at an 18% annual rate, but are companies ready to take on such liability? – 18-19% annual rates are currently purely market rates. If sovereign bonds are being placed under 17% annual rates, then 100-150 basis points are added for additional risk. So the market for quasi-sovereign debt is 18%-19% annual rates. It’s possible that foreign investors will gladly enter into similar hryvnia (denominated) issues. The rate of return on Ukraine’s Eurobonds is currently at 6%-8% annual rates depending on their duration, when the rate of return on hryvnia-denominated securities is at a 17% annual rate. The difference is in 10 percentage points. That’s what should cover the devaluation risk given that the risk of the instrument’s default is one and the same, or even less, as with hryvnia (denominated) bonds. Will there be a devaluation this year of 10%? We don’t believe so. If the hryvnia falls to UAH 28/USD by the year end, then that suggests a devaluation at the level of 5%-6%. In that case, the additional earnings of a foreign investor will be 4%-5% on top of the Eurobond rate. That’s a high return that nearly doubles expectations from the dollar assets of the very same issuer. So foreigners are definitely ready to invest resources. A separate question is who is ready to float securities under annual rates of 18%-19%? Does Naftogaz have the kind of business that allows for paying such a high interest rate? – YoualreadymentionedthatforeignersmayreturntoUkraine’spublicmarketin 2020. This question is about the market’s infrastructure. What’s your attitude towards it now? Is it relevant for our market, and for your business in particular? – Honesty speaking, I lost interest in all those things five year ago and I believe that I didn’t make a big mistake from the view of prospects. If you have many other tasks and opportunities, then you have to ask yourself what is necessary to stay away from in order to focus on what’s necessary? Other people probably didn’t lose. I think they didn’t make a mistake because in the long-term perspective infrastructure will always have a definite value. The question is only when will it be in demand. In the current situation of a horizon of three to five years, I don’t see any prospects for reviving interest in the exchange infrastructure. – So the national commission still has three to five years, roughly speaking, to prepare infrastructure for the arrival of foreigners? – No. They don’t have three to five years. They have already been sitting there for three to five years. Yes, they have done a lot, but they have done nothing from the point of view of exchange infrastructure. That’s why they don’t have anymore time. Following this logic, you can be talking about decades. And then comes the question of what came first – the egg or the chicken. There are no investments because there’s no infrastructure, or is there no infrastructure since there are no investments or market? I believe the issue of infrastructure can’t be separated from the issue of the market. It also can’t be separated from the issue of reforming the pension system. If there won’t be any pension money, then there won’t be the necessity in infrastructure as well. And if there’s no infrastructure, then foreigners won’t come. That’s our closed circle. – Andis it correct or not thattheywillbeginwithinfrastructure? – The commission is “doing something” for three years already. Where are these changes in infrastructure? Ideeplyvalueitseffortsto clean up the market. Truly, phony issuers have left after which a reshuffling of money was felt, as well as money laundering and other questionable operations. Theyalsotookthecorrectsteps from the viewpoint of cleaning the market of non-working operators. There are about 900 licenses, of which less than 500 are left, though real participants are only a handful. There were many discussions about the interest of the EBRD in infrastructure and the creation of a single exchange holding. To me, nobody needs this. Three years have passed and nothing has happened. – How do you assess the squeeze-out initiative? On whose side are you on – the issuers or the shareholders? – What are the issuers saying? – Everyoneis saying that Metinvest or DTEK are being bought for cheap. The price is set by an appraiser. The boldest commentary on this topic was from Serhiy Oksanych, the president of the KINTO company. – This is all in the past!Azovstalcost 70 kopiykaspershare, Oksanych! We dealt with this more than ten years ago. I haven’t heard of our clients enduring any kinds of losses. More likely, they either sold these investments long ago, or they wrote them off. And if they wrote them off, any offer from them is a plus since they haven’t seen any liquidity in them for five to ten years already. The squeeze out is a done fact. As an active member of the Ukrainian stock market, I was ready to sign a collective petition against the “arbitrariness of issuers.”Butit’snecessarytoobjectivelylookatthings: theUkrainianstockmarketwasbornthoughthebackentranceandisinevitablyreturningto its source. We practically have no truly public companies that gained a positive experience from interacting with the stock market. I can only recall Motor Sich, AvtoKrAZ, a handful of banks, and even a handful of industrial companies with difficult-to-pronounce names even for Slavs. The experience of the vast majority of so-called Ukrainian public companies from interacting with the stock market is largely negative. Afterall, atthedawnofthestockmarketit was us, brokers, who were the bone in the throats of oligarchs seeking to buy out the shares of their companies on the cheap. Wecompetedwiththem, inflating purchase prices. They haven’t forgiven us for that and they show us who’s boss at every first chance they get. They can be criticized for that but I wouldn’t accuse them of anything. The law is on their side. Beingapubliccompanyiscostly, andifthere is no upshot from being public, there’s no need to burden yourself or others. I understand that that procedure will simplify the lives of the owners and top management of companies. Decisions will be made quicker and expenses will be fewer. – You recently became a member of the supervisory council of Alfa Bank Ukraine, and remain in the supervisory council of Ukrsotsbank. Canyoucommentonwhy you’re doing this? – I am an independent member of the supervisory council of Ukrsotsbank and Alfa Bank Ukraine. I was invited by Aven (Alfa Bank and Ukrsotsbank co-owner Pyotr Aven – Interfax). What’simportantforthemis examining local peculiarities. And for me, each meeting of the supervisory board, and theworkbeyondthemeetings of the supervisory board, is new experiences, new knowledge, and the expansion of one’s horizons. I’m always happy to help. Besides that, me and Alfa Bank (which is a part of ABH Holding together with Ukrsotsbank – Interfax) are making money and will be making money together. It’s definitely a winning situation for both sides. Earlier I also was a member of the supervisory board of Ukreximbank. But once I understood that I became a politically exposed person as a result, I quickly submitted a statement with the request to free me from my obligations, even before all kinds of declarations, and that took about nine months. As I had already said, politics is not my subject. – Concorde Capital had earlier been an asset manager. Have you planned yet to return to this activity? – We will do that in Cyprus. But we are more interested in Ukraine, where there are interesting assets and industries. And conducting reforms and defeating corruption remains. It’sanawesomechallenge.